The motivation for choosing is title was the force of recommendation of Adam Grant and kind words of appreciation for this title by Daniel Kahneman. Decision making is one of the very important functions of any organization or of any government. When the issue of public policy is discussed, it is the decision making which makes all the difference, just as in a business organisation it happens while devising successful strategies to compete. Decision making is really a very complex process as well as a risky proposition for state and organisations alike. This book holding its premise in the nature of bird Ostrich makes a good sense driven by the force of nature. System 1 and System 2 (thinking systems which drive us to use our brain cells) as narrated and defended in Thinking Fast and Slow by Daniel Kahneman gets blended with the perception policy makers have while deciding on their future course of action. 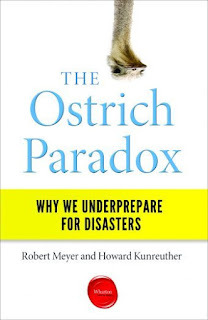 Primarily the book is all about Six Biases that get to play while preparing for disasters or risks. It is defended that the reason why we underprepare for disasters lies in these six biases, viz., Myopia, Amnesia, Optimism, Inertia, Simplification and Herding. The authors believe that the researches on most of the disasters of past years are the result of harmful effects of these six systematic biases. These biases show the weakness while we commit System 1 error to perceive risk in haste and commit System 2 error while making decision. The first part of the book narrates these biases with the examples of disasters occurred in different geographies of the world. These examples make the arguments convincing and the biases strong. Commit to long-term protective planning as a major priority. Commit to policies that discourage individual and community actions that increase their explore to long-term risks. Create policies that consider the cognitive biases that inhibit adoption of protective measures. Commit to addressing problems equitably. Though the book is concise and written from the perspective of disaster management, it travels beyond that boundary and helps its reader to deal with problems through having a perspective. The authors deserve credit for compiling series of disasters and developing a practical argument to look beyond and prescribe measures for preparations.